For our 5th annual visit to the Alps with the 1034 (Surbiton) Squadron Air Training Corps, we again chose to go to Arolla in the Vallenois Alps. 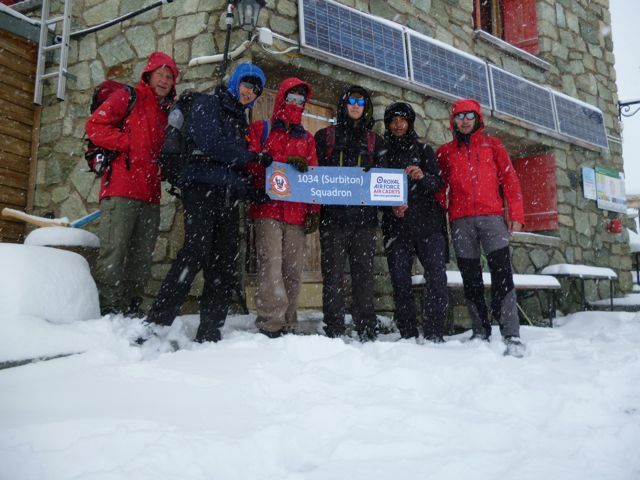 This is a well known, although remote high mountain centre with the campsite at 1970 metres above sea level. Camping Petit Praz claims to be the highest campsite in Europe and the new owners Georges and Laurence made us very welcome. For the first day’s walk we caught the bus down to Les Hauderes and walked back, taking in the delightful Lac Bleu. The second day was a bit more serious and we climbed up from the campsite, past Lac Bleu up to the Cabane des Aigouilles Rouges for lunch. There was significantly less snow than last year. Unfortunately the return via the village of Arolla was the start of poorer weather and it rained all the way down. 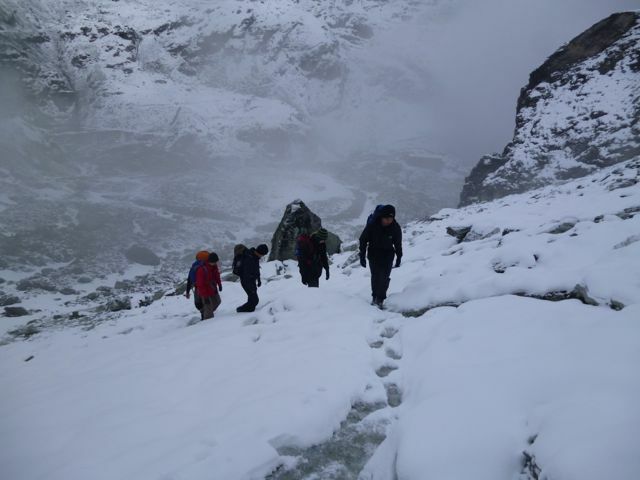 The following day was the start of our 3 day expedition and the weather was not good. We caught the bus down the valley to Vex and a second bus back up the adjacent Dix valley to the Grand Dixence dam. We joined a tour of the dam and went inside the dam and learned about its construction. It was completed in 1964 having poured 6,000,000 m3 of concrete! We caught the cable car from the base of the dam to the top and then walked in light rain/ snow the 90 minutes up to Cabane Prafleuri, our overnight stay. After a comfortable night we set off along part of the Chamonix to Zermatt ‘Walkers Haute Route’ over the Col de Roux, down to and alongside the Lac de Dix and then up to Cabane des Dix. As we approached the snow was falling and the hut gradually appeared out of the gloom. As the previous night, the hut was very comfortable if not a little busy – we were sharing with a Belgian school party of about forty 14 year olds. In the morning with about one foot of snow on the ground we set off from the hut down over the Glacier de Cheilon and up to the Pas de Chevres. We were the first party out so we had the job of establishing the trail through the fresh snow. The crossing of the glacier was marked (over a relatively flat area with no crevasses) but little was seen of the actual glacier. We clambered up the ladders at Pas de Chevres and then walked down into Arolla. 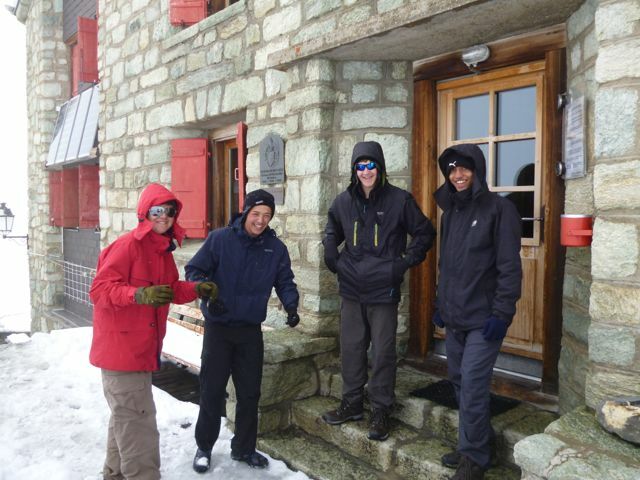 On the final day we went up to the Cabane de la Tsa for lunch. Again the weather was not good and the hot fruit tea at the Cabane was very welcome. In spite of the weather we managed to complete the walks we had planned thanks to four very willing cadets. There was a great spirit among them that kept their morale high and they rose to the challenges. 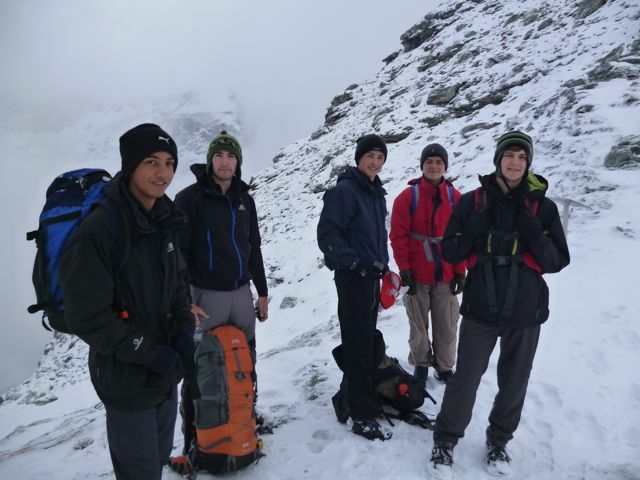 The camp was quite a challenge for the cadets, living in a different culture, walks with typically 1000 metres of ascent, different food, dealing with the basics of the alpine huts, managing the showers (1 SFr gave you about 3 minutes) and particularly coping with the weather. I would like to thank the other staff member, Danny and all the cadets, Yusuf, Matt, Cameron and George for making it such a good trip. I would also like to thank the Ulysses Trust, Headquarters Air Cadets and the 1034 (Surbiton) Squadron CO, staff and Committee who supported us.